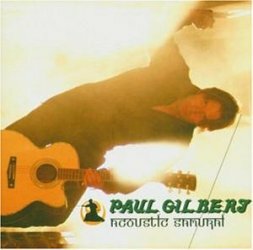 Acoustic Samurai is an acoustic live album which Paul Gilbert recorded at the Hard Rock Café in Tokyo. You can't compare this music to his guitar rock band Racer X which was very popular back in the 80s. The album is calmer and closer to his band Mr Big which was popular in the 90s. Paul Gilbert plays some tracks from his former albums and also some cover versions. The live atmosphere has been captured well on this record. Paul Gilbert is always trying to get in contact with the audience and he's not afraid of making jokes. His songs are a bit too mellow for me, but I think that it could be very entertaining seeing him live on a small stage while having a few (or even more) beers. Nevertheless there are some tracks which amused me. Potato Head is very funny and a well chosen opener. No less entertaining is Abba's Dancing Queen where he uses very high vocals to satirise Sweden's pop export number one. Suicide Lover is another highlight on this unplugged album. Less convincing are some longer tracks on the album where Paul Gilbert shows too much how virtuous his guitar playing is. Down To Mexico and Bliss are songs I had to skip. Although I Am Satan has a promising title, the song itself is disappointingly soft. Every fan of Mr Big will certainly like this record. Other people should listen before buying.